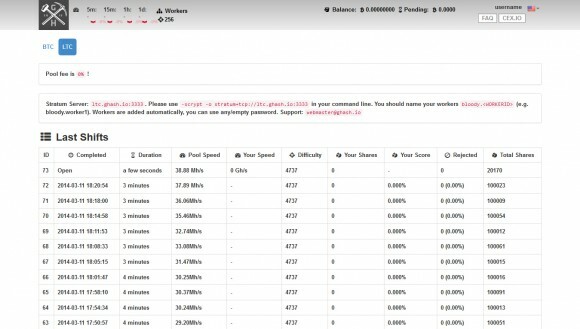 CEX.io Adding LTC Mining to their Pool, LTC Cloud Mining Coming? It seems that the CEX.io cloud mining service for Bitcoin has added support for Litecoin (LTC) mining in their pool Ghash.io and this could also be a sign that the service might also plan on introducing Litecoin cloud mining soon. The LTC mining pool is with a mining fee of 0% just like the fee for the Bitcoin mining pool. Stratum Server: ltc.ghash.io:3333. Please use -scrypt -o stratum+tcp://ltc.ghash.io:3333 in your command line. You should name your workers username. (e.g. username.worker1). Workers are added automatically, you can use any/empty password. Update: More alternative crypto pools are appearing on Ghash.io, aside from LTC there is now DOGE, AUR and FTC. Though unlike with LTC there is nothing yet in the CEX account balance for other new crypto coins, so it is a bit unclear how you will be getting the coins if you start mining them now.